I was recently asked about how to do shading while keeping the colors light. 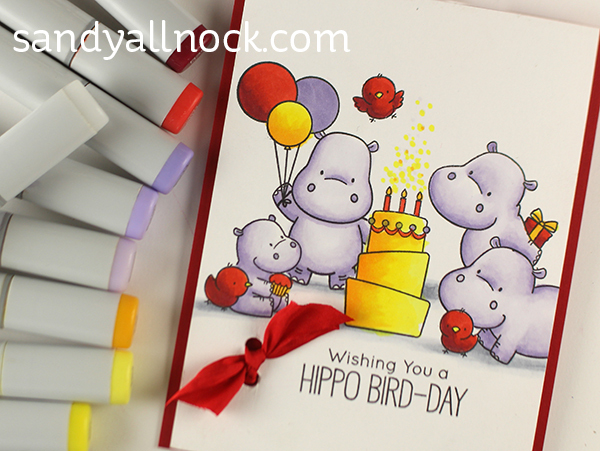 Well, rather than just going for light colors only, there are a few tips I have to color these darling hippos so they look light – but they still have dimension! Watch the video below or click HERE to see it in HD on YouTube. Very enjoyable and informative video. Thanks so much. Just a quick story on the hippo, etc. A number of years ago, I made a card for my daughter with the sentiment: “hippo, birdy, two ewes”, which fits the birthday melody. Next year you can add a couple of sheep for your cousin. 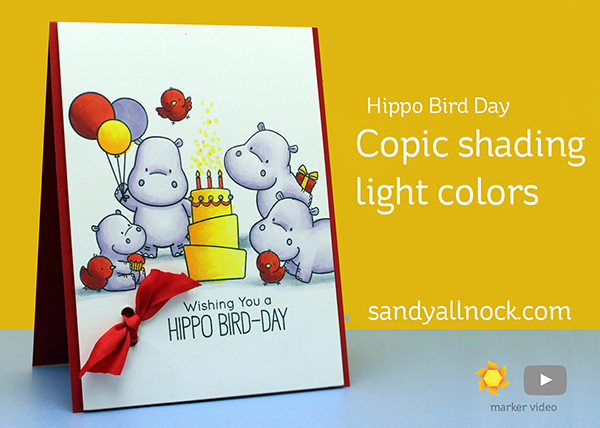 I love this Sandy, the hippo’s are great with this colour. Simply ADORABLE!! love the red birdsj! This is just the cutest card! Thanks for sharing and all your inspiration and info. Oh, I love your card! Thank you so much for the video! Great card. Although if your cousin follows you, he got a preview. Sweet card! Great tips on shading, and how different colors react to it – I’d started to wonder if I was starting to go senile or something! But color pigments are all made from different materials, so I guess it would follow that they’d react differently sometimes when we’re using them. You da bomb! Don’t know what I’d do without you! !